For schools and college buildings to be energy-efficient, healthy, and moisture free, what is required is a holistic approach, which manages the balance of heat, air and moisture movement (HAMM). LABM reports. It is important to consider an integrated approach to airtightness, insulation and condensation control. Understanding the importance of these key elements is crucial to the successful construction and operation of a building, to maintain the durability of the building envelope, to maximising energy efficiency, and to protect the health and safety of the occupants. The incorrect specification or installation of effective thermal barriers will lead to unmanaged heat loss, impacting directly on the energy efficiency of the building and its systems. In many cases, insulation has been a ‘silver bullet’ to improve the energy efficiency of buildings, driven by the need to reduce carbon emissions and reduce energy costs. However, whilst insulation has a key part to play, the most effective solutions will demand a total system approach from the outset. Airtightness is crucial to energy-efficient building design. An integral part of modern building design is influenced by energy efficiency. As thermal insulation requirements have increased, the proportion of energy lost through air leakage has become more evident. The ever-increasing thermal insulation required will be rendered largely ineffective unless the airtightness of the structure itself is addressed. Air leakage greatly reduces the effect of thermal insulation; therefore if energy efficiency is to be improved within buildings in the education sector, this is the most critical area to focus on. Architects and contractors are increasingly turning to air barrier membranes as the most effective means of controlling and reducing air leaks. The two main ways to achieve airtightness in the building envelope are internally or externally, or in other terms, ‘inside of the insulation line’ or ‘outside of the insulation line’. Traditional use of internal air barriers can be more complex and costly to install, needing to accommodate building services such as electrical, lighting, heating and drainage systems. An internal air barrier is only as good as it’s installation. If all the service penetrations are not adequately sealed, performance will be compromised. By moving the air barrier to the external side of the structural frame, external air barrier systems such as Wraptite from A. Proctor Group allow for an almost penetration-free airtight layer, which can be installed faster and more robustly. The solution is a patented external air barrier membrane system, which offers architects the ability to reliably and comfortably exceed current airtightness requirements by design. It is the only self-adhering vapour permeable air barrier certified by the BBA and combines the important properties of vapour permeability and airtightness in one self-adhering membrane. This approach saves on both the labour and material costs associated with achieving the demands of energy efficiency in buildings. 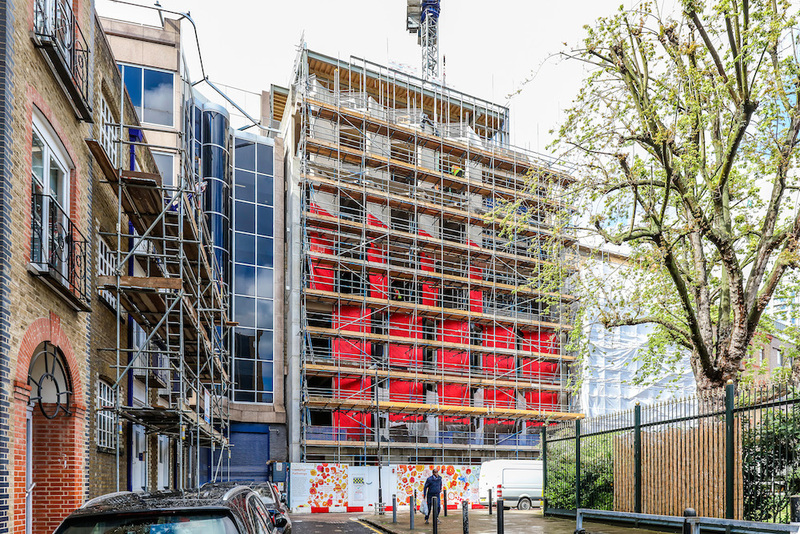 The Wraptite air barrier system from the A. Proctor Group was installed as a solution for airtightness, weather protection and breathability at the new administrative headquarters of the Royal College of Pathologists in London. Designed by architects Bennetts Associates, the new £15m eight-storey building on Alie Street in Whitechapel is the home for the college and features a double-height reception area, flexible office space, a library, meeting and conference rooms and a 200-seat auditorium. Gilbert-Ash was chosen to build and manage the project, which sought to reach BREEAM Excellent assessment. Cladding contractor Windell installed the system as an external air barrier and alternative to a traditional standard breather membrane. The use of a standard membrane would have required mechanical fixing and provided some challenges given the concrete structure of the building. As an alternative, the self-adhesive membrane was applied quickly and easily to the external envelope in continuous pieces. Unlike internal air barriers, which can be complex and costly to install due to the need to accommodate building services such as electrical, lighting, heating and drainage systems, positioning an air barrier on the outside of the structural frame simplifies the process of maintaining the envelope’s integrity, as there are less building services and structural penetrations to be sealed. By reducing the likelihood of potential failures to meet designed airtightness levels, the system helps ensure ‘as-designed’ performance, narrowing the performance gap between as-designed and actual energy performance. 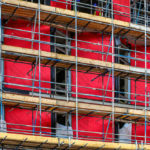 • Complies with use on buildings of high-rise and over 18m under Part B amendments made in November 2018, membranes need to be Class B,s3,d0 or better, with Wraptite at Class B,s1,d0*. • Included within BS8414 testing with cladding manufacturers. • Corner detailing for opening and movement joint interfaces are easily treated. • Improved airtightness and may negate the use of a VCL totally from the design internally, meaning easier a quicker install of dry lining package. • Hygrothermal Modelling (WUFI) will identify whether the construction requires a VCL or not. In some instances the use of Wraptite without a VCL may be the most efficient option. • Improving airtightness may allow you to change thickness or type of insulation used when modelled through SAP or SBEM. • No need to tape sheathing boards as Wraptite is positioned across the whole board. *tested over 12mm calcium silicate board/fibre cement board as per BS EN 13238:2010. All tests carried out to EN 13859-2 standard.